This is especially good when you have dosa batter that is more than 2 days old and little sour. 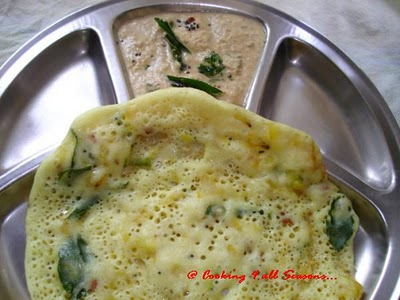 This recipe will supress the sourness because of all the masala and make the dosa really tasty. Heat a tawa, once its hot, take a ladle ful of dosa batter as you would do a regular dosa and spread as a regular dosa, sprinkle oil on top and cook with lid covered. Flip to the other side to get it cooked.